I was looking through a toy magazine a few weeks ago with my kids and saw that they were selling a GIRLS Bow and Arrow set! They were marketing it after the new movie Brave, which is coming out on June 22nd! 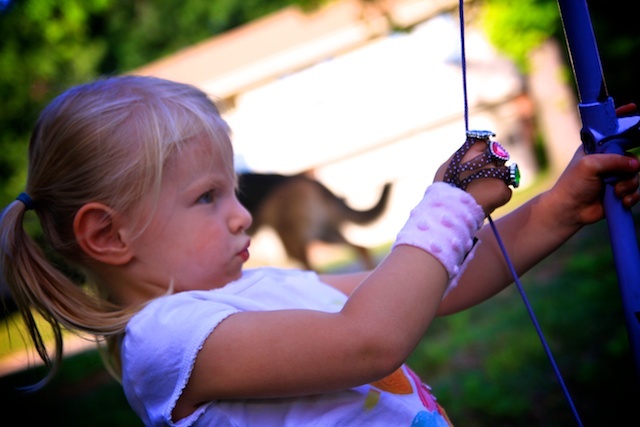 They wanted almost 20 dollars for this cheap plastic Bow and Arrow set! I was looking closely at the picture and also there is no real place for the child to rest the arrow before shooting so I think MOST kids would have trouble actually shooting it! 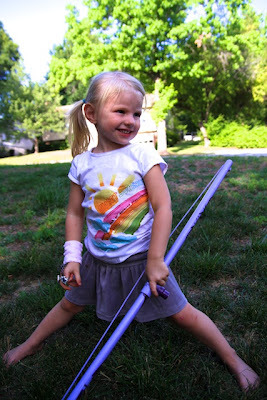 Furthermore, I wanted to add to my post about the Hawkeye costume, which has been getting so many hits, and show you how you can change it up and make a PVC Bow and Arrow set for your GIRL! 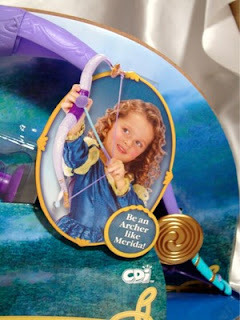 All you have to do is follow the instructions to make your bow HERE! The only changes we made was we used the 1/2 inch PVC (instead of 3/4 inch) and shortened the two piece of pipe to 1 1/2 feet each (instead of 2 feet each)! This makes the bow 3 feet instead of 4 feet long! Since the bow is smaller, there won't be as much pressure on the center cross connector and it will stay strong! Then choose your child's favorite color and spray paint the bow! I went off the idea of the Brave movie and painted some celtic designs on the bow, with a K in the center for my daughters name! 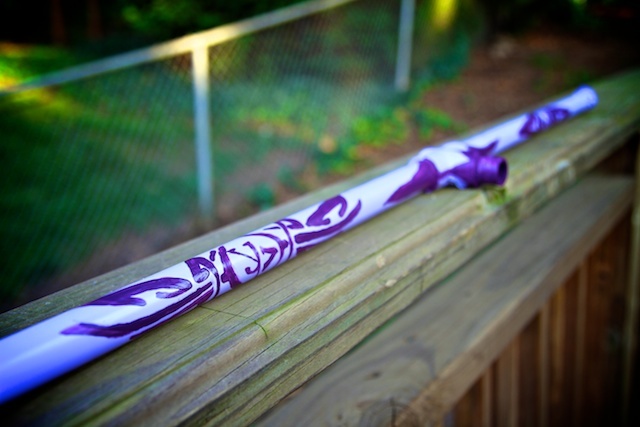 If you paint anything on the Bow, seal it with Mod Podge by just painting over your design and letting it dry! I used a Glossy finish Mod Podge so it really makes my design shine! Below is a picture of what it looks like before your Mod Podge dries! Then, follow the steps to make your arrows HERE! It's the same link as above! I just added a different step! 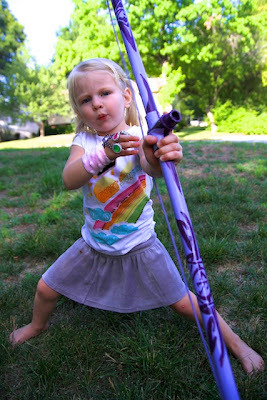 Instead of using tape to decorate your arrows, paint them with pretty colors and seal with Mod Podge! For fun I taped all my wooden dowels together and painted a design across all of them! They turned out cute! 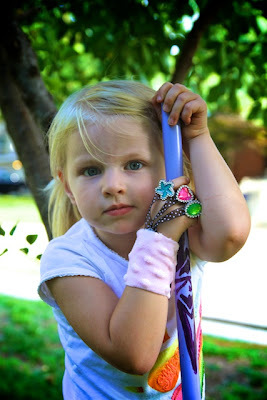 Lastly, I wanted to show you how I made a GIRLS finger glove! I gave this idea in my post about the Finger Glove and Armguard, click HERE to see how to make it! The only changes I made were to the fabric and ribbon used.... and you don't have to do the step of cutting off the jewels on the rings! This Finger glove is SO CUTE!!! Your daughter doesn't need to be into archery to want one of these! I've already had some little girls eyeing it on my daughter! They are so cute and fun to add to the dress up box! Here is a few more pictures of my Kiki and her Bow! 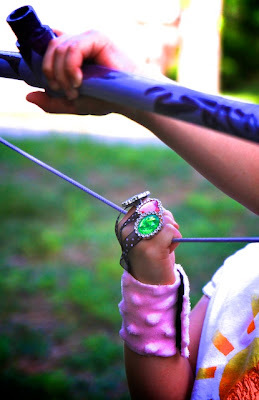 She love to pretend to shoot gum balls in peoples mouths instead of actually shooting the arrows! Wow...great job! That is really awesome, and so much better than the cheapo store-bought one! 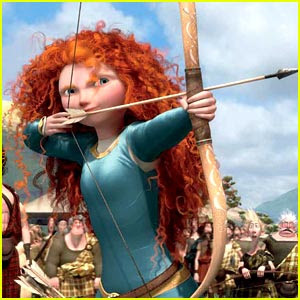 And we are really looking forward to seeing Brave. My whole family is convinced she is Zia's twin. This is AWESOME!!! I saw it on Pinterest and I can't wait to make one for our girl (and then probably her brothers will need their own!)!!! You did such a fantastic job. Thanks for sharing! These are adorable! I can't wait to make them for my girlies. So I take it with the new size (1/2" and 3') that you don't need to duct tape the connector, right? Yes by making them that size you don't need duct tape! It holds really well with the PVC glue! many neighbors play with it and it's good as the first day! Your girls are gonna love this project! These bows are so much fun! I am going to take my girls to see Brave then give them their "gift"..they are going to LOVE them! Thanks so much for posting this!!! What a good mommy you are! Take your girls to the movie and then give them their bows! You know what you could do!?! You could have them paint a little something on their bow themselves! That way it's more personal! I don't have to cook the way I do, I just choose to! It's a lot better to watt this way! I do it more for the health of our family! I also LOVE giving options to people, even if I don't make a recipe GF, DF, or even Vegan! The pretzel recipe is awesome! I'm sure your girls would love to make them with you! so fun to roll out the dough etc! This is an awesome idea. Thanks for posting it. I just made two for my children this past weekend. Great idea Colleen!! I am off to pin it on my Brave Party Board!! Awesome. Just made one for my daughter. I changed the design a little. I only drilled the holes through one side of the pvc pipe to keep the knot and excess string inside the pipe. Then you can get a cap for the pvc for a more finished look. Thanks! !